In the framework of its CSR Action Plan for 2017, ANTEA Cement finalized the ‘Healthy Eyes for Successful Education’ project through an award ceremony hosted by the ‘Ramazan Jangozi’ school of Thumana village. The project was designed and implemented in cooperation with the Albanian Center for Social Services DDAER with the generous support of ANTEA Cement. The initiative was launched in July 217 for a duration of four consecutive months. A team of professional oculists and social workers closely worked with elementary school teachers and parents in the community of Thumana with a double folded objective: to assist and inform teachers and parents on the impact of eye healthcare in the learning performance of children and to offer professional oculist examination for the identification and proper treatment of children’s’ vision problems. A total of around 400 children successfully completed the series of diagnosis and awareness raising sessions were 245 have been selected for a re-check whereas for 82 of those who exhibited vision problems during the first vision check-up, ANTEA Cement and the Albanian Center for Social Services DDAER organized in-depth examinations to the professional clinic in the capital city, Tirana. During the final ceremony, customized glasses were distributed to beneficiary children who were diagnosed with vision malfunctions. 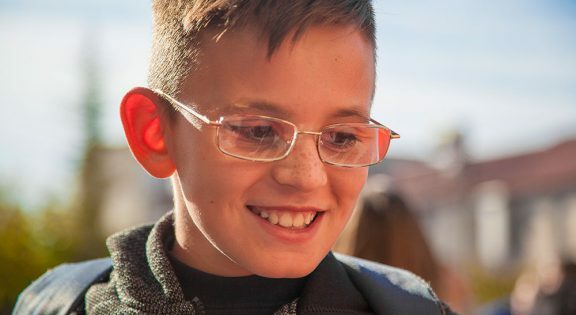 More than 80 participants took part in the event, among them, all the team of professional oculists, social workers and managing staff of the initiative as well as beneficiary school children, parents, supporting teaching staff and the representatives of the Municipality of Kruje. The event was welcomed by the keynote intervention of ANTEA Cement General Manager, Mr. Mario Bracci who focused on the needs of the community and the mutual cooperation between the company and the local stakeholders in improving the quality of life. ANTEA Cement CSR and communication officer Mr. Klajdi Gjondedaj, who introduced the vision and main objectives of this project. ANTEA Cement Environmental and CSR Manager, Mrs. Stela Pepa who emphasized the importance of such activities as part of the company’s continuous commitment to supporting the community and engaging with them into finding new solutions and alternatives for better health and wellbeing. The Director of the Thumana School , Mr. I. Xhafaj and Mr. F. Cerhozi representative of Municipality of Kruja congratulated ANTEA Cement for this initiative and welcomed future projects that could continue to support school children and their families. Medical assistant and oculist, Mrs. S. Zhuka and the project manager Ms. S.Guri introduced key aspects of the implementation of the project and stressed the importance of its continuity for sustainable impact on the improvement of the quality of life of the community. ANTEA Cement is committed to maintain an enduring relationship with the community and contribute to the improvement of their health and wellbeing.